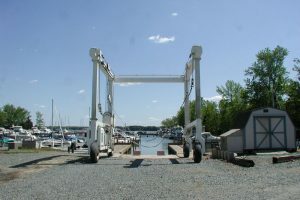 In Two Rivers’ protected yacht basin we offer fixed and floating slips for boats up to 43 feet in length. All slips have water and electric service and water included with your slip rental. 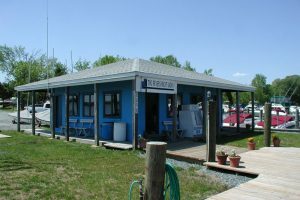 The marina has convenient and clean restrooms and showers which were recently remodeled. The large swimming pool was also recently redone. There is a lots of open space sounding the basin including a sandy beach and many picnic areas. 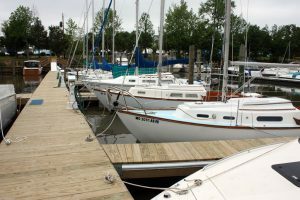 Our boat yard repairs all types of boats and offers full service. On site mechanics repair and maintain inboard and outboard boat engines. We also offer boat cleaning, painting, storage, winterization, and more services. The fuel dock has 89 octane gas, maintains a well working waste pump out, and has a dock store. Our store carries ice, soda, water, ice cream, snacks and marine supplies. Two Rivers Yacht Basin is an authorized Achilles Inflatables dealer with new models in stock. We also offer new Tohatsu outboard motors. Boat brokerage is on site with many used boats available. Give us a call at 410-885-2257 to schedule a time to come a see what we have to offer. Two Rivers Yacht Basin is located by boat one half mile in from the Elk River on the North side of the Bohemia River.